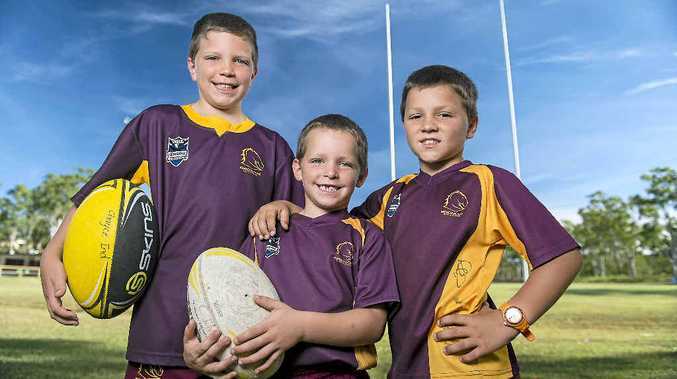 LACHLAN, Chayce and Lincoln Ind can't believe there are still a handful of spots open to junior players to attend the Calliope Rugby League Junior Development Day. With Petero Civoniceva, David Peachey and PJ Marsh on deck for the day, the trio nagged their mum Shannyn to get a spot for them. Now, two days from the clinic on Sunday morning at Calliope's Bunting Park, they can't believe the 250 spots are not all full. Lachlan has been planning for weeks what he wants to work on. "Being able to tackle properly - Petero will be great to help me with that," he said. Even Lincoln was puzzled players were not on a waiting list, having been to the first two. He wants to see how three ex-NRL stars make it even bigger. "Last year I learnt how to pass and kick. These players will make it even better," he said. Organisers Shannyn Ind and Stuart Claridge will still take names until the day and there is a possibility of having entries that turn up on the day, if the few places are not already filled. The Development Day begins 9am Sunday and runs through until 12pm.